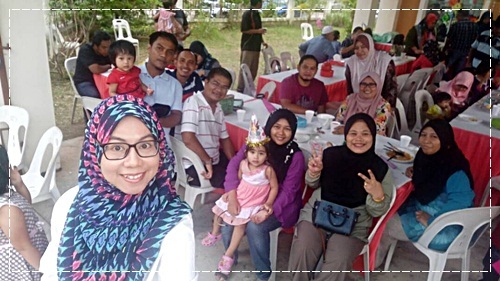 There was a birthday celebration for Nor Hana Nabihah's first birthday today. The event was held by the parents, Mr. Hisham Abdullah and Puan Nurhafiza Zulkifli, who are my ex-colleagues from SMK Taman Universiti. The "party" was held at their house in Taman Mutiara Rini. As usual, I met many old friends there and I think, I had eaten more than I should. With all the different kinds of delicious food served, who could resist such temptation. Hopefully I will still be invited for Hanna's upcoming birthday parties after this.